Our national zeitgeist certainly has turned nasty and fearful since the last Republican debate. World War III! Armageddon! Terror at home! I never imagined myself ever saying this, but I am grateful that the pressures of last minute holiday shopping have partially restored our national sanity–short-lived as it will no doubt be. Will City of San Diego Make Dubious Move to Get Blanket CEQA Exemption for Mission Valley Stadium? Is the City of San Diego about to go for a blanket CEQA exemption for the Mission Valley stadium? Dan McLellan thinks so. He used to sit on the San Diego Stadium Coalition, was its vice-president for awhile and is a longtime ardent Chargers fan. He departed the group so he could speak out more aggressively, he told us. Editor Note: Mr. Flynn’s post is in response to How to Tell if the Chargers Negotiations are Real by Liam Dillon which appeared in Voice of San Diego. Editor Note: Mr. Flynn’s article is a response to Taking a Wide Lens on Mission Valley by Mary Lydon, published in Voice of San Diego. It seems hard to believe that the San Diego Latino Film Festival has been around for 22 years, but it’s true! But with full adult status, come some growing changes. In the background since last year, a transition has been achieved from the Hazard Center to the Fashion Valley Center. But those are not the only changes to be felt. Phillip (Phil) Lorenzo has returned to SDLFF as Exhibition Director after a seven year absence during which he worked with SDAFF. One other thing that was different this year—it didn’t rain to mark the beginning of the festival. Instead, we were in the throes of a heat wave courtesy of our Santa Ana winds (in keeping with climate change predictions). Employees and the community supporters at the Mission Valley Hilton will be engaging in a five day hunger strike starting today in protest of a decision by the property’s new management company to dismiss nine long term hotel workers. Following weeks of protests, including a sit-in where 20 people were arrested, employees at the Mission Valley Hilton Hotel were elated last month after hearing that their jobs would not be eliminated as part of a takeover of the property by Evolution Hospitality/ Tarsadia Hotels. 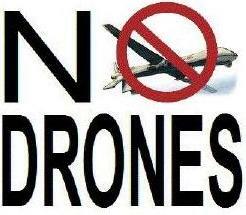 “National Anti-Drone Days of Action” from April 4 through 7 in San Diego start a month of protests across the United States against the policy and practice of drone warfare and secret surveillance. Local and national organizations are coordinating a series of events to increase the attention to why drone killings and surveillance are bad practice and policy for the United States. San Diego’s “Anti-Drone Days” is not one, but a series of events (see listing). San Diego is where these protests will start based on the region’s role as the “national capital” of military drone production. Killer and surveillance drones pour out of San Diego at increasing rates, matched by the rise in deaths and dismemberment from US strikes across the globe. Twenty people were arrested Friday evening during a protest at the HiltonMissionValley hotel during a protest stemming from the refusal of management to take step to protect employee jobs during the sale of the property. Tarsadia investments is currently negotiating to buy the location. Those arrested included hotel workers, family members, clergy and community advocates. The hotel has been the focus of organizing efforts by union advocates for months now. Employees were recently forced to re-apply for their jobs by the current owner, HEI Hotels and Resorts, a move aimed at breaking the back of a burgeoning employee organizing effort. Mission Valley mayhem… A press conference being held yesterday by the Employee Rights Center to air charges that the hotel’s operator, Connecticut-based HEI Hospitality, had been named in a complaint alleging wage theft totaling approximately $250,000, was disrupted by loud music apparently at the direction of hotel management.